Here is a zone post up play from Utah Utes Head Coach Larry Krystkowiak. Krystkowiak just is entering his 8th season as a head coach and 6th with the Utah program. In seven years, he has compiled a 137-93 record, including back to back seasons with over 26 wins. 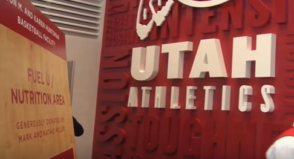 His first year at Utah, his Utes went 6-25 and in just two seasons won 21 games. He played at Montana from 1982-1986 and was selected in the 2nd round of the 1986 NBA Draft. He played in the NBA for almost ten years and also played overseas. In 1998, after his playing career, he joined the Montana basketball staff as an assistant. He then moved to Old Dominion as an assistant in 2001, and in 2003 was named the head coach of the Idaho Stampede. He then was the head coach of Montana from 2004-2006, made a stop in the NBA for a few seasons, and took over for Utah in 2011. This Utah Utes Zone Post Up was used last season by Coach Krystkowiak. 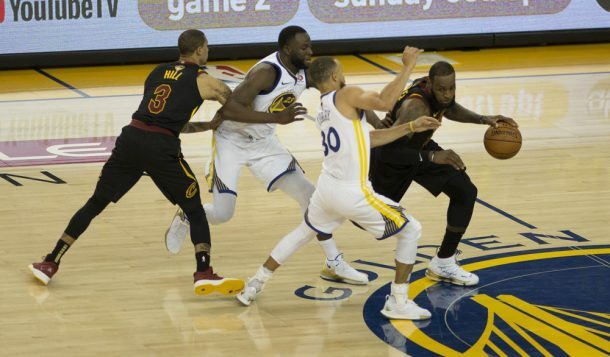 This post play is used against a 2-3 zone defense and starts with 4 players on the perimeter and the 5 man posting up inside. 1 passes to 4 who passes to 2 on the right wing. 4 then cuts through to the left corner and 3 flashes to right elbow. 2 then passes to 1 who drags the ball left pulling 3 out of the high post. On the pass back to 3, x2 has to step out and guard the ball. 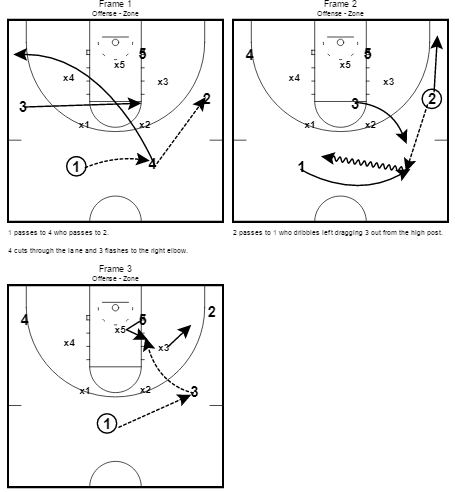 5 looks to duck in on x5 inside and x3 will be guarding 2 in the corner. If x3 is out towards the corner, 3 looks to pass inside to 5. If x3 is preventing the post pass, 2 should be open in the corner for a shot.